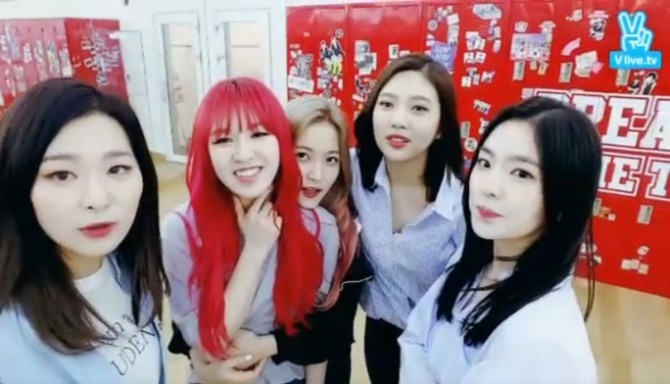 Quintet girl group Red Velvet, eyeing a comeback, sported new hairstyles before Naver V app viewers on Tuesday. Wendy dyed her hair crimson red, which reminded members of “Little Mermaid” -- as Yeri called it. Yeri had the tip of her hairs pink, while the rest were colored gold. 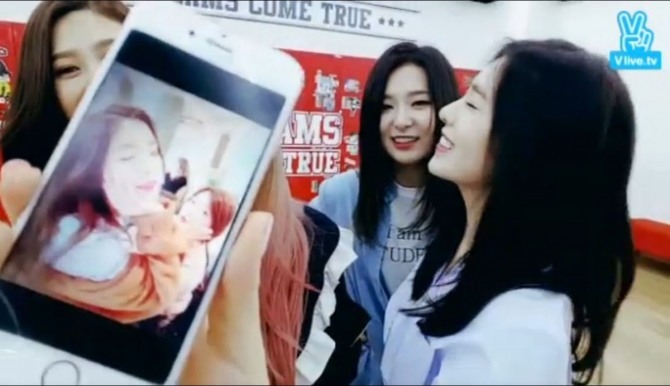 Joy had her hair cut short, while Irene dyed her hair black, the first time since her debut. Seulgi also trimmed her hair due to some damage at the tip of her hairs. They also flaunted their nails, which were all in different colors. Seulgi was praised by members for her being ranked 71st in “100 The Most Beautiful Face of 2015” by a blog dedicated to movies, TC Candler. Yeri, at the end of the show, showed some selfies with members and pictures taken while practicing and on the sets. They talked about the wigs they wore while taking selfies. Red Velvet planned to make a comeback on Tuesday midnight with new ballad album “July 7,” but it has been postponed to Wednesday midnight. 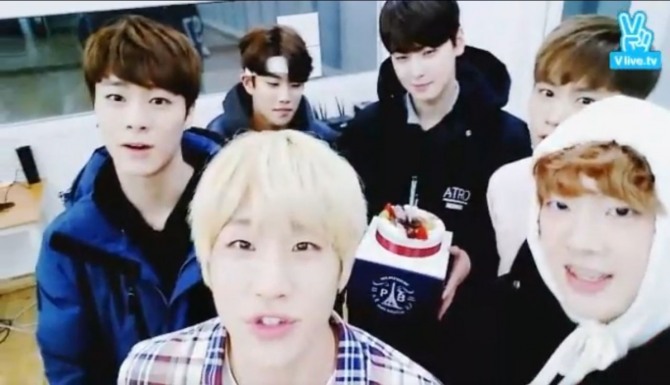 They will appear once again on V app at 10 p.m. Wednesday. JinJin added he had seaweed soup that day, as per Korean tradition. Girl group Secret’s member Jun Hyo-seong showed fans around the sets of the forthcoming music video Tuesday. “It feels like I am in Europe,” Jun said. 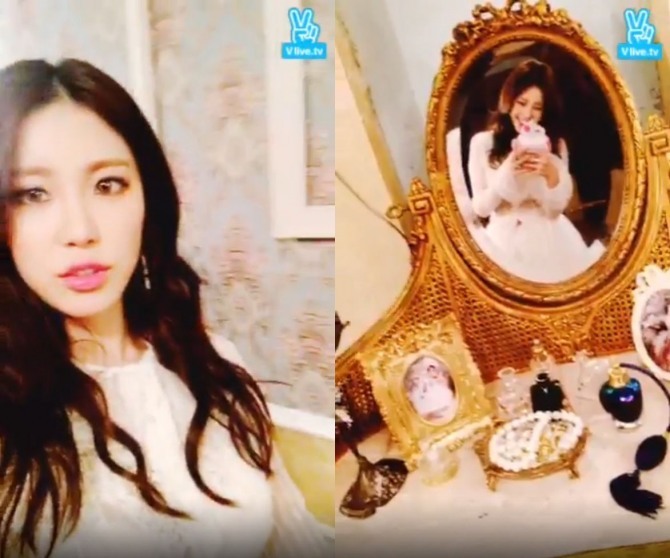 Jun showed fans a fake terrace set, and her room with European-style interior design. “I wish these were all mine,” she said, looking at the luxurious mirrors and cosmetics. 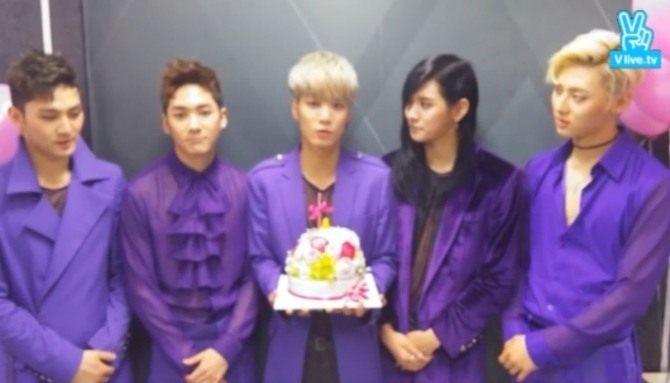 Quintet boy band NU’EST celebrated their fourth anniversary of debut with fans on V app. Members, clad in purple-colored outfits, held a cake and blew a candle before they shared their thoughts about the last four years. “I can’t believe four years have already passed,” Minhyun said. “Recalling the four years, it was very eventful. How time flies!” Baekho said. “You fans mean a lot to us. You made us happy. I appreciate that. Please keep your support,” JR said. “We are right here before the camera thanks to your support. I will never forget your support,” Ren said. Members then read handwritten letters, showing gratitude to international fans. The letters will be posted on the band’s official online community.